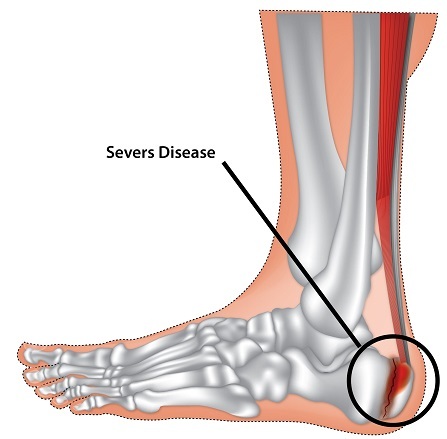 Sever’s disease is also called calcaneal apophysitis. It was first described by Haglund in 1907 although Sever received more credit for describing the condition. It is a painful bone disorder that results from inflammation of the growth plate of the heel. A growth plate is an area at the end of a developing bone where cartilage cells develop into bone cells. It is a common cause of heel pain in growing kids especially those who are active. Sever’s disease usually occur during the growth spurt when kids grow most rapidly. It can occur anytime between 5-13 years old for girls and 7-15 years for boys. It was found that 29% of patients were involved in soccer, basketball, gymnastics and running. One study found running and soccer to be the most common sports for male patients and gymnastics and soccer most common for female patients. Another study also found that 73% of patients participated in track and field (with 90% of the runners specialising in middle and long distance races). 24% of patients engaged in less than 5 hours per week of activity, 44% involved in 5-10 hours of activity, 21% in 10-15 hours and 11% more than 15 hours per week. These findings suggest a strong link between Sever’s disease and the amount of activity patients were involved in. The patient is generally an active child who has a growth spurt, presenting with pain in one or both heels, aggravated by increased activity. The individual will usually have limited ankle joint movement. The pain is severe to the point that the child will limp to avoid putting weight on the affected heel. Although there are many theories on the cause of Sever’s disease, the most common one is that overuse and stress on the heel bone through increased activity is a major cause of calcaneal apophysitis. The growth plate on the heel is sensitive to repeated impact from activities such as running leads to muscle strain and inflamed tissue. Other potential causes are obesity, a tight Achilles tendon and structural problems such as having a flat foot or high-arched foot. Many professionals have stressed that the diagnosis of Sever’s disease is a clinical one (made via patient history and clinical examination) but no studies have validated the statement or suggested an alternative diagnostic method. The main diagnostic tool is the pain on mediolateral compression of the heel in the area of the growth plate in the absence of more serious causes such as trauma. It has been acknowledged that radiographs (X-rays) are inadequate for diagnosis but is useful as a differential diagnostic tool to rule out other problems such as fractures and tumors. Diagnosis is best made with the clinical presentation paired with radiologic and other tools if there is doubt about the diagnosis. The recommended treatment for Sever’s disease is varied. As there is no reliable data about the causation of Sever’s disease, no clinical trials comparing management carried out, none of the following treatment regimens can be said to be better than others. Posterior heel pain with a clinical diagnosis of Sever’s disease is a common disorder among pre-teen children. Although several causes have been identified as a potential cause of Sever’s disease, none of these causes have been investigated. Haglund P. Ueber fractur des epiphysenkerns des calcaneus, nebst allgemeinen bemerkungen ueber einige aehnliche juvenile knochenkernverletzungen. Archiv fur klinische Chirurgie 1907; 82: 922. Sever JW. Apophysitis of the os calcis. New York Medicine Journal. 1912; 95: 1025. Harding VV. Time schedule for the appearance and fusion of a second accessory center of ossification of the calcaneus. Child Development. 1952; 23: 181. Hoerr NL, Pyle SI, Francis CC. Radiographic Atlas of Skeletal Development of the Foot and Ankle. Charles C. Thomas, Springfield, IL, 1962. Micheli LJ, Ireland ML. Prevention and management of calcaneal apophysitis in children: an overuse syndrome. Journal of Pediatric Orthopaedics. 1987; 7:34. Kvist MH, Heinonen OJ. Calcaneal apophysitis [Sever’s disease] a common cause of heel pain in young athletes. Scandinavian Journal of Medicine & Science Sports. 1991; 1: 235.